September marks the sixth month of Numenware, with 85 posts in that period, almost exactly one every two days. I’d like to take this opportunity to convey my warm thanks to all my readers for their interest and comments (and putting up with my occasional idiosyncratic posts about Japanese things—cured sea cucumber entrails, anyone?—and who knows what else). Alexa regularly ranks us in the top 100,000 most visited sites on the web, and lists us as the most popular site in the Top > Science > Social Sciences > Psychology > Psychology and Religion category. Technorati also has us close to the top 100,000 and rising. We’re averaging more than 500 visitors per day now and over 2,000 unique visitors per month. We’re getting linked to more and more and show up on major blog search sites, including Yahoo!’s new blog-enhanced news search. What’s popular? At the top of the list recently are posts about Bhutan’s Tiger’s Lair, Stigmata, Pachacuti as Builder, God and the brain in your gut, and Computational models of neurotheology. Perhaps readers have noticed the new tag-based index available on the index page, hopefully increasing the site’s browsability. This uses a service from a company called TagCloud. As we move ahead, I want to make Numenware more interesting and incisive, continue frequent posting, tighten up my posts for those whose blog-reading time is limited, and, most importantly, focus more on ideas and hypotheses as a way to make some initial order out of all the raw material available to us in this fascinating and critically important field of neurotheology. And no, I don’t know where the mural shown above comes from. 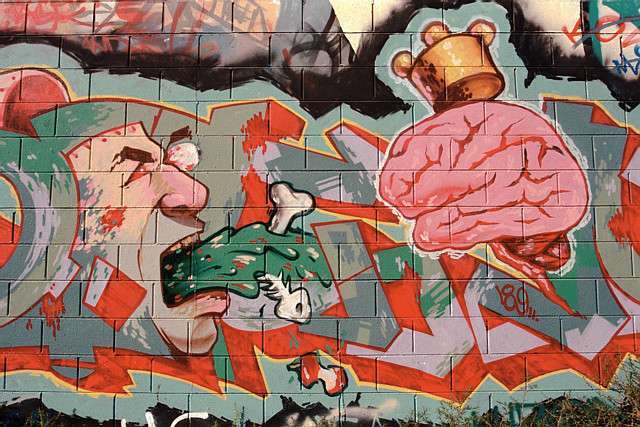 Corbis’ description of it is simply “graffiti painting of man vomiting”. This entry was posted on Friday, January 14th, 2005 at 19:15	and is filed under Uncategorized. You can follow any responses to this entry through the RSS 2.0 feed. You can leave a response, or trackback from your own site.